In this post, I'll walk you through the process of adding an exposed elastic waistband to a skirt. This is a quick and easy way to add an elasticized waistband without having to create a casing. I'm going to show you how to sandwich your exposed waistband between the lining and skirt, so the edge of the band is enclosed. I've already written about how much I like making a skirt with Simplicity 2414. It's an easy, tiered skirt, which only takes about an hour to make. It does require a lot of gathering, though. In my last post, I wrote about an easier method for gathering with dental floss. Disclosure: This post contains affiliate links, which means I may receive a percentage if you make a purchase using these links. This won't cost anything extra to you. I only link to things I like and use, and the proceeds help me to run this blog. Thank you for supporting me! I used this same waistband in my post on turning a vintage tablecloth into a skirt. When you only have one layer, though, the edge of the waistband is just sitting there on the inside of the skirt. It lays flat and isn't really uncomfortable, but I think it looks nicer to have the bottom edge of the waistband enclosed between two layers. First, just make your Simplicity 2414 skirt as normal, but make two versions of the same skirt: one in the top layer and one in the lining fabric. I used the peach and red fabric below. You can't really see it here, but the peach fabric sparkles. I'm planning to make a coordinating t-shirt in the other fabrics. You don't need to cut out the casing and elastic from the pattern. Just wrap your waistband elastic around your waist/hips (wherever you like wearing your skirt), and cut a comfortable length. This elastic is a little stiff and doesn't have as much stretch as some elastics, so be sure to take that into account. Sew your elastic ends together to make a round band of elastic. The easiest way to add the waistband to your skirt is to divide each piece into quarters and then match up those marks. Lay your waistband flat, and mark each end of it, either with clips or pins. I have the seam for the waistband on the left hand side below. Seams are an easy place to mark first. I've clipped each spot, so I don't lose track of it. Now pick up your waistband and fold it lengthwise in the opposite direction. Match up your previous two marks in the middle. Mark the two new ends. Do the same process with your skirt. You can already see that the skirt is much bigger than the waistband. That's okay. We'll gather up the skirt to fit the waistband later on. Here I've marked the two side seams first. The skirt pattern has you mark center back and front, which is helpful. The side seams are in the center now, marked with clips. Clip the sides of the skirt (which are really the center back and front). My pattern marks matched up exactly here, which is good. The skirt is divided perfectly into quarters now. Now match up your marks. 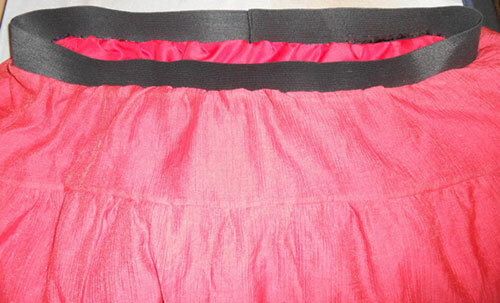 If you want the waistband seam on the center back of the skirt, be sure to match up those quarter marks. As noted previously, the skirt is bigger than the waistband, so pull up your gathering stitches after clipping the waistband to the skirt, matching up each quarter mark. Distribute the gathers evenly throughout each quarter. Sew the waistband to the skirt, stretching the elastic slightly as you go. Now comes the tricky part. You want the raw edge of the skirt and lining to fold inward toward the waistband, hiding all of the raw edges and enclosing the edge of the waistband. Be sure the wrong side of the skirt is showing on the inside of your sandwich, then the waistband, then the lining should be right side out. My skirt fabric was slightly see-through, so I wanted the right side of the lining facing the wrong side of the skirt. Reverse the lining if you want the wrong side of the skirt and lining facing each other. Divide your waistband into quarters again. Do the same with your lining. Match them up. Sew it all together. I serged all of the raw edges at this point, but you could also just trim them down. Turn it all right side out. And now your waistband is enclosed between the two layers of the skirt.